Unlike most other successful aircraft in the Mirage series, the F1 has a conventional layout instead of a delta-wing design. It is powered by one SNECMA Atar turbojet. The Mirage F1 started its career as an all-weather interceptor designated F1C. The F1C main armament was the Super 530 air-to-air missile. The Mirage F1B is a tandem two-seat variant of the F1C designed for training. South Africa ordered a radarless variant for the attack role. This variant was designated F1A and was also sold to Ecuador and Libya. 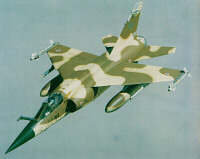 The variants delivered to South Africa were designated Mirage F1AZ and F1CZ for the interceptor variant. Likewise did the Iraqi export aircraft receive the designation F1EQ and F1BQ for the trainers. The F1CR was an upgraded F1C interceptor for the reconnaissance role. The other upgraded variant of the F1C was the F1CT, which is an advanced tactical combat aircraft.